What is now the Town of Afton was part of a tract named Clinton after the then Governor George Clinton. It was purchased from the Oneida Indian Tribe and settled by assignment to "Vermont Sufferers" in compensation for lands lost in Vermont, in 1787. In 1791 the Township was renamed Jericho. In 1814 the name changed to Bainbridge, and in 1857, South Bainbridge became a separate town and was renamed Afton. Afton, "derives its name from Afton Water, a small river in Ayreshire, England, immortalized by the Scottish poet, Burns." This was stated by James H. Smith in his History of Chenango and Madison Counties published in 1880. Today, Afton is quite a different place from that described in the 1880 History of Chenango and Madison Counties. With the advent of the automobile, passenger train service has ended, leaving our Delaware & Hudson Station to be converted in to the River Club Restaurant. The building of Interstate 88 during the 1960's bisected many valley farms, further hastening the decline of dairying. I-88 has also influenced business and trade. Afton has always been Oneonta-Binghamton oriented, because of transportation. Today, one can work, dine and be entertained at more distant places. This has altered the make-up of our Main Street which was once a mixture of many stores and businesses. Except for a few retailers such as Horton Hardware, many of our business blocks are occupied by small shops and service businesses. Education is the biggest employer in Afton. The old wooden Afton Academy was replaced by the brick High School in 1908. This has been expanded by successive additions. A staff of about 8 in 1923 has increased to 160+ with a fleet of school buses to transport over 550 students. The Village of Afton was incorporated in 1892. Shortly after, in 1895, the Afton water system was developed, enabling the use of up-to-date fire-fighting equipment by the Afton Hose Company which is housed in a modern building on Spring Street. The Afton Free Library, founded in 1933, has a very attractive space in the Afton Community Center, a new facility which also houses the Village of Afton offices and the Susquehanna Room for public meetings. The Town of Afton offices are housed on the East side of the River. The Afton Museum, chartered in 1986, and operated by the Afton Historical Society, occupies a house and barn on Main Street. 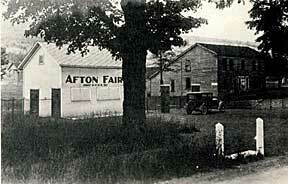 The Afton Fair has been held continuously each year since its founding in 1889. Afton is a town of over 2800 and 800+ residing in the village. Nine churches line our streets with a long and rich history: Baptist established in 1836, Methodist in 1851, Episcopalian in 1860, Presbyterian in 1875, and the Roman Catholic in 1949. There is also a Methodist church in North Afton established in 1828. The Universalist Church, organized in 1818, was active for almost a century on the East Side, before being sold in 1924 and demolished in 2008. Newer congregations are Christian Assembly and Hope Church. The Afton Inn continues the tradition of a hotel on the site since 1823. 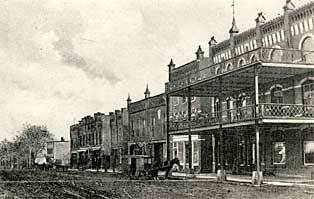 During the heyday of the railroads, there were as many as three hotels at the same time. The Afton Golf Course is one of the earliest in the area to open and brings many players to Afton. Little League teams play on Davey's Field. The Afton Sertoma Club and the Greater Afton Chamber of Commerce sponsor many local projects. The Afton Community Chest raises monies annually to support organizations and activities. Despite the many changes in modern life, Afton has been able to maintain an active business life.